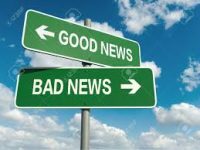 Do you want the good news or the bad news..? So, let me summarise the state of play regarding treatment. The number we are aiming for is zero. The mutated plasma produces what is called a paraprotein. It is this useless protein that damages bones and is a key indicator of myeloma. Not heading in the right direction (anecdotally 40 is deemed too high) however, the rate of increase (from 56 to 72 to 74) has plateaued so hopefully this means it is starting to get under control. That said the Doc was expecting a drop rather than a slight increase so they have doubled up the dosage of all the key drugs to try and force a reaction. I’ll find out next week if that has worked and if not, a new course of treatment will need to be planned. Other side effects of note are my taste buds have disappeared; everything tastes of water. Boring but I still have an appetite so I’m not wasting away just yet. And at 0200 Thursday morning, Tyson and Lewis made a comeback for an underhand round 3 of bareknuckle barbarity. Brutal, but this time I had a Beardsley and a Kaye in my corner to fight back. Let me introduce you to the good news of this week. It’s at this point I want to say thank you to each and everyone of you who has picked up the phone, sent a message and just been within ear shot since this all kicked off. You have kept me positive and motivated to stare down the barrel of this and say with confidence that I will not be beaten. Your support is beyond humbling; I am not eloquent enough to articulate my feelings to you all in this post but please know that without your support, facing this would be a very different prospect. So, I get an email from my mate Rhys who did the Ironman with me last year (Have I told you I did an Ironman in 2016! I don’t like to talk about it.. :-)) and it had the following audio attachment from Paul Kaye, the global voice of Ironman! He is the guy who announces your arrival onto the red carpet..he’s a bit of a big deal to those in the know. What a guy to do this and what a boost. But more important than even the message was that Rhys took the time to even think about doing this for me. As with all the messages I have received from you all, your consideration and friendship is what is most important to me right now. And then the Beardsley no more than 12 hours later! As a life long Newcastle United fan, local hero’s don’t get much bigger than the great Peter Beardsley and he picked up the phone and called me on Thursday morning for a chat to see how I was getting on! Again, another friend who will remain nameless because he does not like the focus, got in touch with the club and the below letter arrived from the great man a few weeks back. As if thats not enough, at 0830 I’m sitting at the breakfast table, chatting to the guy about life, the Toon and getting invited for a guided tour of St James’ Park with Pete (we are on mates name terms now!) the opening game of the season vs Spurs! What a guy. 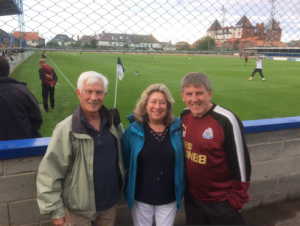 And then, if he could not be any more decent, mentions that he is in Whitby for a tournament with the reserves and would my parents like to be his guests at the game that evening! Class is permanent. Incredible, life affirming and its all thanks to you guys being so considerate and just brilliant friends. So a crap news week regarding the treatment not working was turned on its head. I go in today for dose 4 of this round of chemo then I have the next 2 weeks off which I am looking forward to. I’ll have more blood tests next week which will (hopefully) show a reaction to the new dosage but if this program is not going to work, we try something else. In summary, you guys rock. Your support, love and friendship is mind blowing. Despite the underlying reason for all this, I am very lucky to be able to call upon you all as friends. What a post – the good certainly outweighing the bad…. Keep these coming – we are all rooting for you…. Cheers Jim. I’ll be penning post 4 this evening. Looking forward to catching up in the near future. We can’t imagine how you are feeling but this blog you have started is such an inspiration, Pete. Most people would hear those results and be devastated, but you have picked yourself up, dusted off the crap and looked forward. You have my utmost respect for that. If only we were closer, we could try and help you guys somehow. Just know you are building your strength and your boys will look up to you even more, as their hero! Praying for you & Jennifer & the boys. Thanks Louise. Bit of an odd time but you have to be grateful for every day and make the most of it I reckon. Really enjoy seeing your guys growing up through the photos on Facebook. Clearly got 2 talented sportsmen in the family! I’ll let you know when we next hit London (maybe bank hol week) as it would be great to see you all. Definitely. We are around that weekend. Yes the boys clearly show more sporting skills than their parents !! Thankfully they love being active, it’s just up to us to make sure they have all the opportunities we never had. Take care and keep smiling…. you’re a fighter! Eloquent enough for me Pete. You’re in our thoughts mate. The blog is great and we read it avidly, keep up the good work. I”ve no doubt the boffins will find some drugs to get this in check then life can get back to some semblance of normality. Glad you like the blog. My first foray into writing stuff so it can only get better! Hope you are all well and we can catch up on the right side of the Pennines soon. Thanks for the note Christine. Going for tests Friday so hopefully get the results pretty quickly after that. Fingers crossed! Cheers mate. I’m coming up for the first game of the season on the 12th and 13th if you are about? 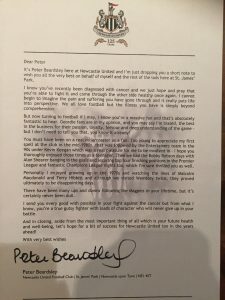 Lovely gesture from Beardsley, one of Newcastle, Liverpool and England finest as a player and person. Totally blown away by the gesture. Such a nice bloke. Hope you and the family are well. We are due down the bank holiday week if you were around for a coffee. We will be staying in Carshalton so can pop over to Banstead anytime. Hi Yvonne. Thanks so much for the message, really nice to hear from you. Both Tim and I are very lucky, although the folks (thankfully!!) now focus all their attention on Max and Seb! I’ll keep you posted on progress which hopefully, will start to head in the right direction in the coming weeks. Hi Peter, great to hear your positivity and keep it up. At least the bad stuff has plateaued out and the new treatment will do the trick. Who’s Peter Beardsley? Only joking he’s played some great cricket. By the way the taste buds do work again, eventually. Take care and get sorted soon. Ps I’ve never been an Ironman and never will be. Thanks for the message. good to hear form you. I still have great memories of flying with you guys when I was a kid. I’m looking forward to the taste buds returning (sounds like you have been through this nonsense too?) Everything just tastes of water. And trust me, if I can do an Ironman anyone can. Stick your name down and I’ll help you to train! Just to let you know we are all thinking about you and willing the treatment to work! Stay positive! Hi guys. Thanks for reaching out. Really appreciate it. I’ve no doubt the docs will get it under control soon enough. Going for tests Friday so watch this space. Hope all is well down south. 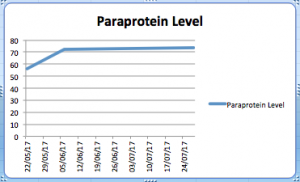 The para protein has at least plateaued. It should be heading down soon. You are very strong. I do not think most of us can match you in any way in our lives. Full respects for your efforts and productivity in the face of hardship. Hi buddy. Amazing to hear from you. Been so long since Leeds right?! I go for tests Friday so fingers crossed we can find out if the new dosage has worked. Appreciate your positive comments. Just got to get on with it and make the best of every day. Where are you nowadays? God is the ultimate healer! You are loved by so many and by Him most of all. He can make a way out of no way. The results may not reflect what we want, but God can turn things on a dime. Always praying for you my friend! Hey Tracey. Despite all of this nonsense I realise how very lucky I am with all my friends and family supporting me through this. Must be so hard if you don’t have people who care around you. And I hope you are right about him upstairs, I could do with a bit of divine intervention right now! !Thanks as always for your thoughts and friendship. Means everything right now. We must meet up sometime in 2018. When I can fly again I am going on a mega holiday and will be taking the States in so watch this space!